Carpenter bees are generally harmless creatures that forage your garden for wood. But in some cases, these buzzing insects can cause damage to your home. A trap can help you catch these bees, so you can release them elsewhere instead of killing them. Carpenter bees have fitting names, as these insects carve perfectly-round holes into wood to build their nests. They hang out in their nests all winter long, and emerge in the spring to find a new place to build another nest. It just so happens that your home is the perfect spot for these bees to drill holes for a nest. So, how can you trap these bees and finally put an end to the hole-drilling? We’re going to share DIY traps you can make at home as well as commercial traps you can buy in the store. Can You Release the Bees? Most carpenter bee traps work in similar ways to lure in the bees, and keep them from getting back out. The great thing about these traps is that you don’t have to use any chemicals, and if you’re brave enough, you can release the caught bees back into the wild. Traps generally have a piece of wood with a hole in it and a bottle underneath to catch the bee. The bee flies inside to lay eggs, and tries to exit through the hole, but lands in the bottle. Once inside the bottle, the bee can’t figure out how to get back out. Carpenter bee traps are easy to make at home. A few supplies are all you need, and you may even have most of them in your home already. Take the square, and measure 7″ from the end of the 4×4 at a 45-degree angle (radiating downward). Draw a line along that edge. Use the saw to cut along the line you drew. Flip the wood over to face the flat bottom up. Mark the center of the wood. Drill a 7/8″ hole at the center to about 4” deep. Mark entry holes on each side of the block. Each hole should be at least 2” from the bottom. Use the 1/2″ wood bit to drill holes at a 45-degree angle. You’ll continue drilling until your hole connects with bottom hole. Mark the center of the lid. Mark the center between the middle hole and the lip along the edge of the lid on two sides. These holes will be where you screw the jar to your trap. Use the punch to make holes. Use the 1/2″ metal bit to make a larger center hole. Leave the other holes at their smaller size. Place the lid back into the jar’s ring. Screw the lid into the bottom of the trap (the flat side of the wood block). The center hole in the lid should line up with the center hole in the wood. Add another screw to the top of the trap, so you can hang it. When carpenter bees see the trap, they’ll fly into the hole with the intention of laying eggs. The 45-degree angle of the holes makes them unable to see the entry hole. The light from the jar will permeate up through the bottom hole. The bee will follow the light (thinking it’s an exit), and will fall into the jar. Once inside the jar, the bee can’t figure out how to get back out. This DIY trap is very effective, but as you can see, it takes a little work to get this done. If you have a free afternoon and all the tools needed to make the trap, this option may be the right choice for you. But if you don’t have all the tools and materials needed for this project, you may be better off buying a commercial trap. If you don’t have the time or the tools to make your own trap, you can find carpenter bee traps for sale online or in home improvement stores like Lowe’s and Home Depot. A Lowe’s or Home Depot carpenter bee trap will probably cost more than what you can buy online. We found several carpenter bee traps Amazon. The Wood Bee Gone trap from Chrisman Mill Farms is very similar to the homemade trap listed above. If you don’t have the tools and materials on hand to make your own, this trap will be much more affordable than buying everything you need and making it yourself. The trap features holes on all four sides of the box, and a hole at the bottom that leads to a Ball mason jar. The bees fly into the hole, and make their way down into the jar where they get trapped. A chain is built into the top of the trap, so you can hang it wherever carpenter bees are most active. Made in the USA, this trap is durable and one of the best rated on the market. The manufacturer also recommends putting one inch of soda and 5 drops of dish soap to attract and kill wasps, hornets, and yellow jackets. View pricing and availability of the Wood Bee Gone trap from Chrisman Mill Farms. The Best Bee Trap from Best Bee Brothers has a very similar design to the Wood Bee Gone trap, but it comes at a slightly higher price. The trap features a wooden box, which looks similar to a bird house. The holes on each side of the trap lure in carpenter bees looking to make a nest. The bees fall into the plastic jar below. One difference between this trap and the previous is that the bottle has a funneled top. While the bottle is included with the trap, you can also use your own if you want. Any 12-ounce, 16-ounce or even 2-liter bottle will work. If you have a serious carpenter bee problem, the 2-liter bottle may be the best option. View pricing and availability of the Best Bee Trap from Best Bee Brothers. Now that you’ve set your traps and you’ve caught some carpenter bees, you’ll need to repair any damage they’ve done and take steps to prevent future damage. Carpenter bees emerge in spring and fall. These are good times to fill abandoned holes to prevent the damage from causing structural issues. Holes can be filled with: steel wool, caulk, a dowel, wood glue or even aluminum foil. Once the holes have been filled, paint over them completely. What happens if the bees are still active? 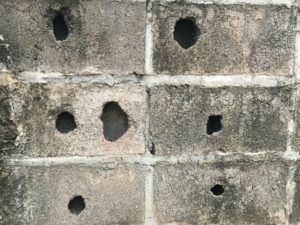 Active holes can be treated with an insecticide, such as boric acid, pyrethrum or carbaryl. The insecticide should be applied directly into the hole to prevent the killing of honey bees and other beneficial insects. Within a day or two, you should be able to fill the hole up and paint over it. While not a bulletproof method, painting wood can help deter carpenter bees. Paint all surfaces (that includes the undersides and backs of any exposed boards). Use a sealing primer first, and then apply at least two coats of paint. If the bees are relentless, you may need to seriously consider replacing your wood covering with non-wood covering, such as aluminum, fiber, vinyl, or stone. If you really like the look of wood, treated lumber or hardwood may be the better option. These are both less susceptible to damage from carpenter bees. If you move quickly and are brave, you may be able to release the bees away from your home, but most people prefer to let the bees die in the trap. Releasing can be dangerous, and they may just return to drill more holes. We don’t recommend releasing only because the bees will be agitated and far more likely to sting. There’s also no way to keep the bees inside the trap as you remove it from the wood block. 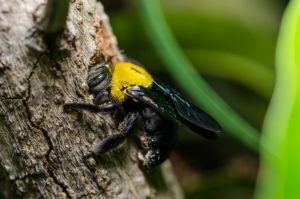 Carpenter bees can be a serious nuisance, but if you take the time to set an effective trap, you can catch them before they start doing some serious damage to your home. Once the traps have taken care of the problem, make sure that you take the time to fill in holes properly. 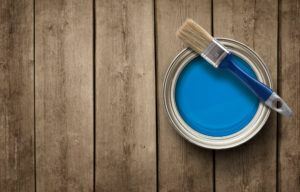 Painting the wood can help deter bees from making future holes, but if they just keep coming back no matter what you do, you may need to consider replacing the wood with something like aluminum or vinyl.